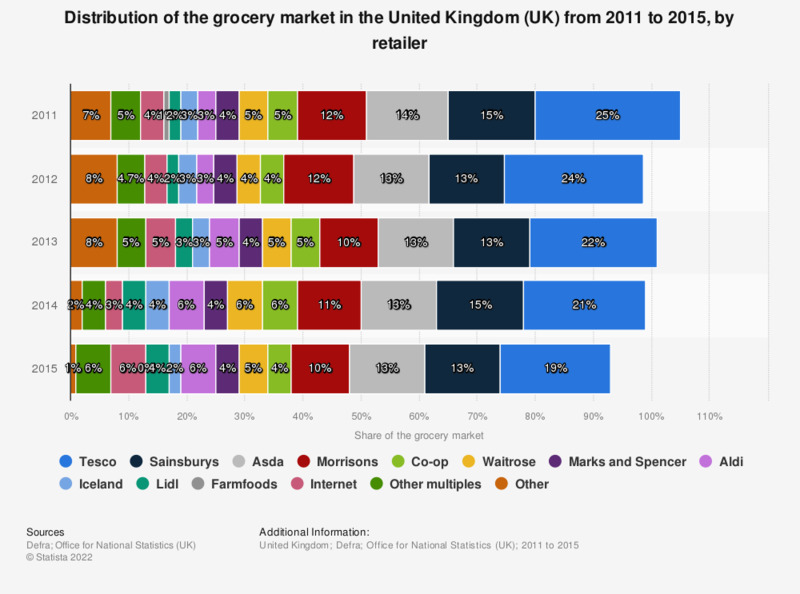 This statistic displays the distribution of the grocery market among leading grocery retailers in the United Kingdom (UK) from 2011 to 2015. Tesco held the largest share at 25 percent in 2011, dropping by six percentage points to a 19 percent share of the grocery retail market by 2015. Prior to the popularity of the discounters, the grocery retail market was dominated by the 'big four' supermarkets: Tesco, Sainsbury's, Asda and Morrisons. On the back of the economic recession and growing inflation, however, consumer behavior has shifted in favor of cheaper alternatives and discount supermarkets. The resulting 'price wars' has led to supermarkets lowering their prices and the highest share of food volume sales on promotion in Europe. Crucially, this has caused increased volatility in the grocery retail market and, as of 2017, Aldi overtook the Co-operative to become the fifth largest supermarket in the UK according to data from Kantar Worldpanel. Data for 2011 taken from the 2013 edition of Defra's Food Statistics Pocketbook. Both are probably due to rounding. Everything On "Marks & Spencer" in One Document: Edited and Divided into Handy Chapters. Including Detailed References.